John Hulsey was born in Wichita, Kansas in 1953, and studied painting at the Kansas City Art Institute and the University of Kansas before moving to New York in 1980 to paint and exhibit his work. He returned to the Midwest in 1990 to build a studio and home. His work has been exhibited in solo and juried group exhibitions, and in galleries in New York, the Midwest, the Southeast and California and has received numerous awards and grants. His painting was featured on the cover of Time Magazine and his works are included in many private and corporate collections: University of South Carolina Medical School; Blue Cross/Blue Shield, St. Louis, Missouri; Environmental Law Institute, Washington, D.C.; Pace University Environmental Law School, White Plains, New York; the Hudson River Reference Collection, Garrison, New York; National Portrait Gallery, Smithsonian Institution, Washington, D.C.; The Hudson Riverkeeper Fund, Garrison, New York and the United States Embassies in Australia and Jordan. 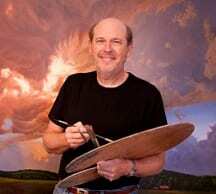 His work has been featured in American Artist magazine, Watercolor Magazine, Fine Art Connoisseur magazine and International Artist Magazine, where he was named a Master Painter of the United States. He has been awarded residencies by the National Parks Service at Glacier National Park, in Montana, Yosemite National Park, in California and Rocky Mountain National Park, in Colorado. His plein air painting workshops in Provence, France, were the feature article of the Fall, 2004 issue of Watercolor magazine. A monograph on his work appeared in the April 2006 issue of Fine Art Connoisseur Magazine.